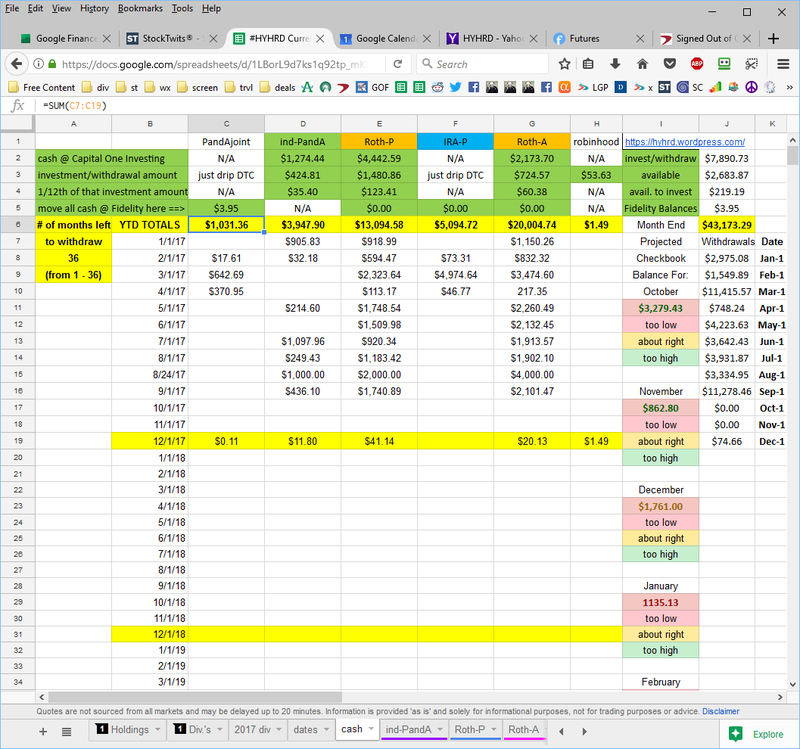 Holdings that are being DRIPped are shown on our Google sheets on the Dividends tab. As of June 1st, 2017; Only holdings that are part of the DTC discount plan in the Fidelity accounts will be DRIPped, i.e. ; everything held at Fidelity is being DRIPped. I am also DRIPping our joint taxable account at Capital One Investing. So, only the Roth IRA accounts at Capital One Investing are NOT being DRIPped as well as the small Robinhood account I just opened. I have re-set all Fidelity accounts to hold only DTC-eligible securities. I believe this is the best way to maximize these accounts, at this broker, at this time. The DTC discount plan is not available at Capital One Investing, so a different tactic is being employed where I invest on my schedule, in the holdings I want, as often as I want. The most any of these (AIP) “Automatic Investment Plan” investments will cost is slightly less than $1.00. Sell trades cost $6.95 each. I tried to get them to lower it, but it’s only on our joint account that we still have the old “Costco Promotion” pricing of $10/month for Advantage program and $4.95 sell trades. They offered me some trade credits, instead. C’est la vie! Part of the cash in our Roth IRA accounts will be withdrawn each month on an ‘as needed’ basis. The available withdrawal amounts are shown on the cash tab on our Google spreadsheet. For October & November, 2017 there were no withdrawals from any accounts as the checking account had a sufficient balance. In our ind-PandA account, I plan to withdraw $0.00 from the account. In my Roth-P account held at Capital One Investing, I plan to withdraw $0.00 from the account. In my wife’s Roth-A account held at Capital One Investing, I plan to withdraw $0.00 from the account. In my IRA-P account, I plan to transfer $0.00 to PandAjoint for a net transfer of $0.00 after 25% tax withholding. In my Roth-P account held at Fidelity, I plan to transfer $0.00 to PandAjoint for a net transfer of $0.00 after 25% tax withholding. In my wife’s Roth-A account held at Fidelity, I plan to transfer $0.00 to PandAjoint for a net transfer of $0.00 after 25% tax withholding. In our PandAjoint account held at Fidelity, I plan to withdraw $0.00 from the account. In my Robinhood account, I plan to withdraw $0.00 from the account. Any cash left in the accounts will be allowed to accrue for any upcoming stock purchases and/or withdrawals. The cash balance of each account and the amount available to invest are shown on the cash spreadsheet. The withdrawal amounts are also shown. Withdrawals will be taken monthly as needed. This is subject to change as necessary. We need to plan for my wife’s first MRD withdrawal from her TSA in November of 2017. We might need to plan for my first MRD withdrawal in April of 2025, which should be totally covered by dividends for *at least* the first few years. But, if I convert 1/6 of my remaining IRA each year starting in January of 2018, then the balance at the end of the year before my MRDs are scheduled to start will be $0.00, eliminating the need for any MRDs! There will not be any MRDs for my wife’s IRA (except her TSA!) because I totally converted her holdings to her Roth IRA in 2016. UPDATE: January 1st, 2016 Partial conversions to our Roth IRAs have been initiated on 12/31/15 from our IRA accounts. CYS & ORC positions have been rolled over, and AGNC positions will be next, followed by NYMT and then AI. I also plan to convert my CNSL holdings to my Roth IRA this year, and I also plan to totally convert my wife’s holdings to her Roth IRA this year. I still have a few years to go before RMDs are required and will most likely convert 1/7 of the remaining holding(s) in my IRA each year starting in 2017. This, of course, resulted in huge tax bills for last year and this year, and I will be wihholding 25% from each withdrawal for upcoming tax bills. UPDATE: March 24th, 2017 Partial conversion to my Roth IRA has been initiated on 3/24/17 from my IRA account. I am converting 60 shares of ORC, which is approximately 1/7th of the total balance. I also purchased 85 shares of ORC so I am now holding 145 shares in that Roth IRA account at Fidelity. Eventually, the remaining shares of ORC will then be transferred to Capital One Investing (ShareBuilder). CLM, CRF, FFC, FLC, GOF, GUT, MAV, MHI, PFD, PFO, PHK, PHT, PMF, PML, & PMX are being DRIPped in Fidelity accounts because they may reinvest at a discount!